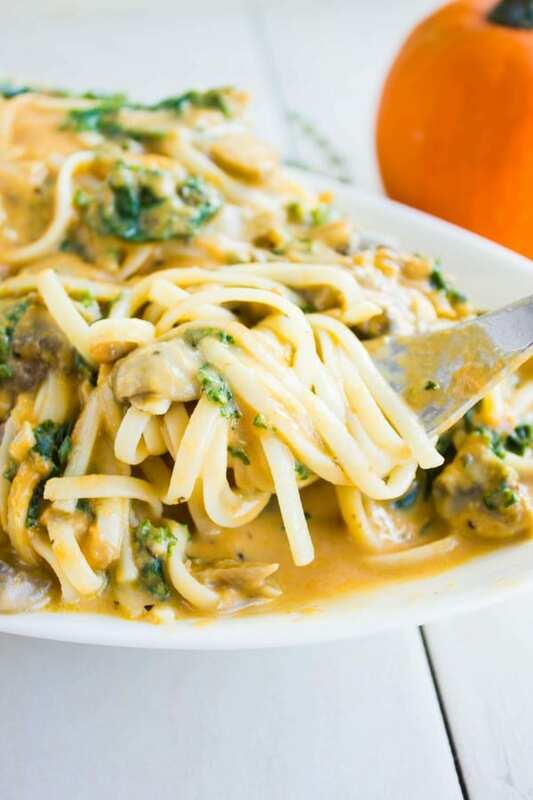 This kale mushroom pumpkin Alfredo pasta recipe is an easy fall-inspired pasta dish you can make in under 20 mins! Sautéed kale and mushrooms drenched in a smooth creamy pumpkin Alfredo sauce—seasoned with a little bit of garlic and a pinch of allspice, then finished off with fresh thyme and Parmesan cheese. 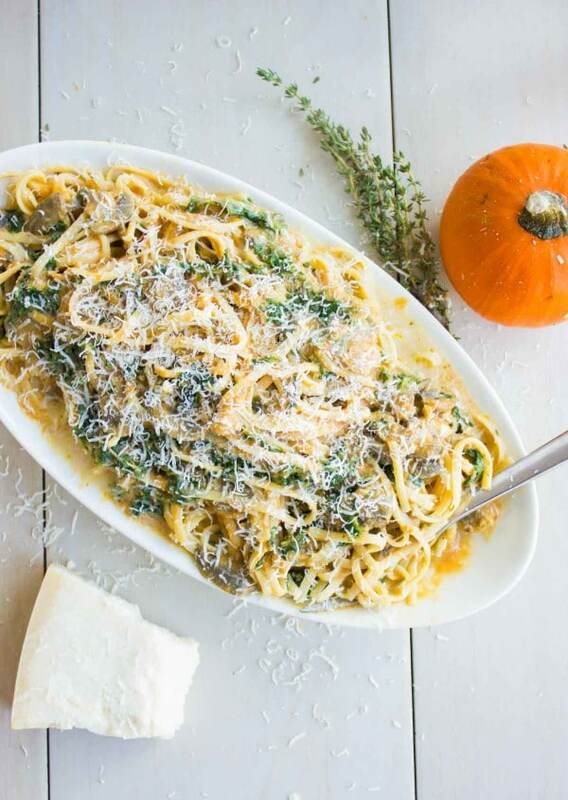 This kale mushroom pumpkin Alfredo pasta recipe is the perfect comfort food pasta dish to cook when you’re in a hurry but still want to impress! Picture sautéed kale and mushrooms drenched in a smooth creamy pumpkin Alfredo sauce. Vegetarian fall comfort food at its best! 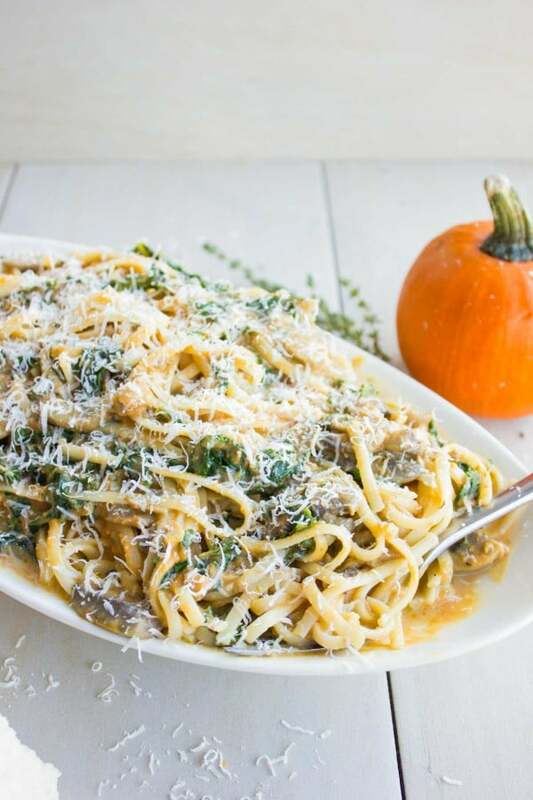 This Pumpkin Alfredo Pasta is a fabulous seasonal pasta dish that’s too good to be missed. I am starting to pumpkin-up many recipes here on the blog, to get the pumpkin fever out of my system before I move on to the next season! CHRISTMAS! 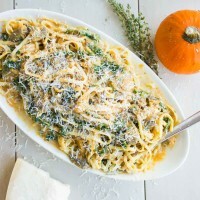 This kale mushroom pumpkin Alfredo pasta gets its gorgeous flavor from the slightly bitter kale, the umami of mushrooms, the richness of cream, the sweetness of pumpkin, the kick from garlic, the herbal notes from the thyme and the slight smoky-ness from allspice. 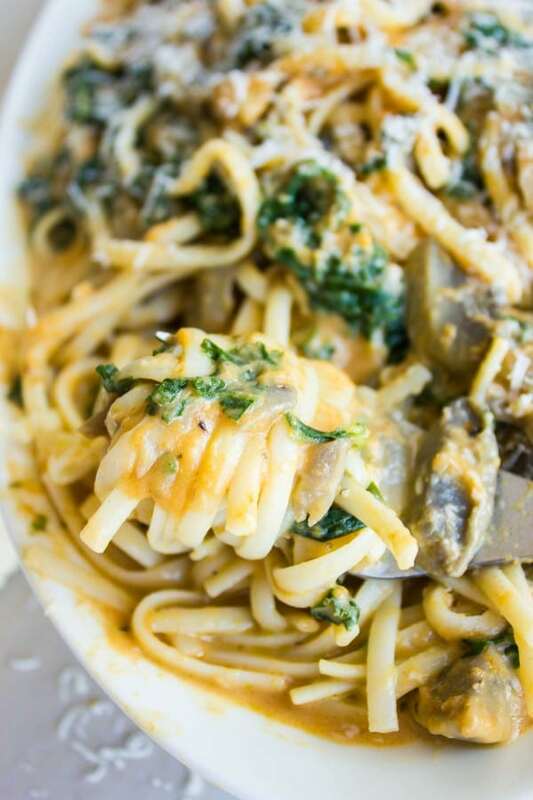 So you can now imagine how each bite of this fabulous kale mushroom pumpkin Alfredo pasta tastes like WOW! Also, you can make this Pumpkin Alfredo Pasta as light or as decadent as you wish, following my instruction in the recipe. I know my sister is reading this now thinking I’m teasing her. She called me a couple of weeks ago asking me to stop posting anything pumpkin anymore! 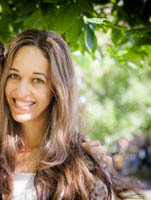 You see she’s not spiteful or anything—she lives in Vienna, and for some reason she isn’t able to find any canned pumpkin at grocery stores there, yet she was tempted to make those awesome espresso glazed pumpkin spice donuts. She ended up buying a large fresh pumpkin, peeling it, cutting it, steaming it, cooking it and evaporating all the moisture from it to have the pumpkin paste we get in cans over here. The things we do for pumpkin! So while she said those donuts were absolutely worth every ounce of work, she and apparently a few other friends from Vienna decided they need to pass me this no-more-pumpkin-recipes-please message. And I really tried for a bit now, then I gave up and made this Kale Mushroom Pumpkin Alfredo Pasta—and I am posting it with a big “sorry Vienna” message! Ok, on the bright side, you guys get to enjoy the absolute freshest of the fresh, while we only get to enjoy the canned stuff..so maybe I should twist this around and start complaining. I wish I could claim this pasta is easily made with fresh pumpkin, which I can, but I won’t claim it takes only 20 mins. The recipe starts with a nice sauté of fresh kale and sliced mushrooms. Then we add a little bit of cream, pumpkin puree and pasta water to form the smooth, creamy and sweet Pumpkin Alfredo sauce. I’m not sure if we should get into the cream argument on this, but for the record, yes there is cream in here. And also for the record, how much cream can be totally personalized. So you can make this pumpkin alfredo sauce entirely with just cream and pumpkin, or you can make it with cream, pumpkin and pasta water to lighten up the sauce. I have to say when it comes to Alfredo, I don’t prefer lightening anything up, but the Mr. preferred his pasta water and pumpkin sauce which had just 2 tablespoons of cream. Seriously, it’s completely optional. But even though this is a kale mushroom pumpkin Alfredo pasta, it’s still A-l-f-r-e-d-o and in my mind that can only mean cream. No judging. 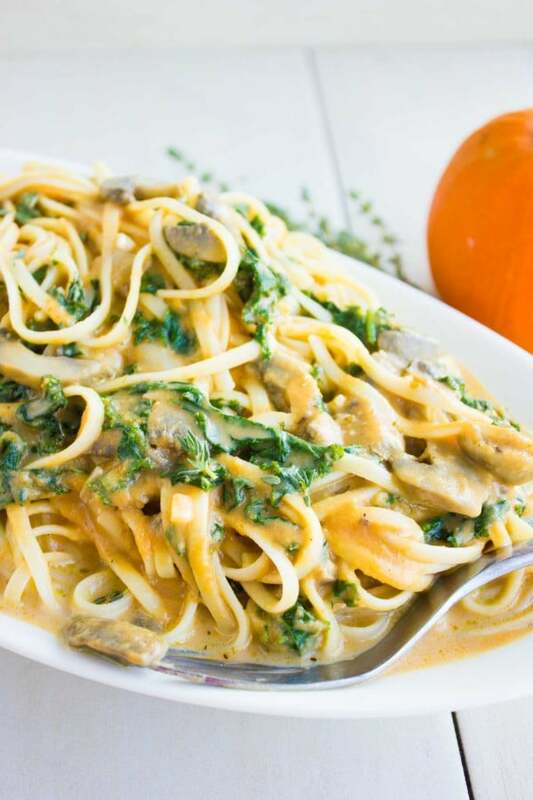 Make this pumpkin alfredo sauce with just cream and pumpkin puree, or with cream, pumpkin and pasta water to lighten up the sauce. As for the mushrooms, button mushrooms are perfect. For even more umami, go for shiitake and portobello. Make this Pumpkin Alfredo vegan by swapping butter for Earth Balance (Vegan Butter) and cashew cream for cream. Add some coconut aminos to up the umami and skip the parmesan. 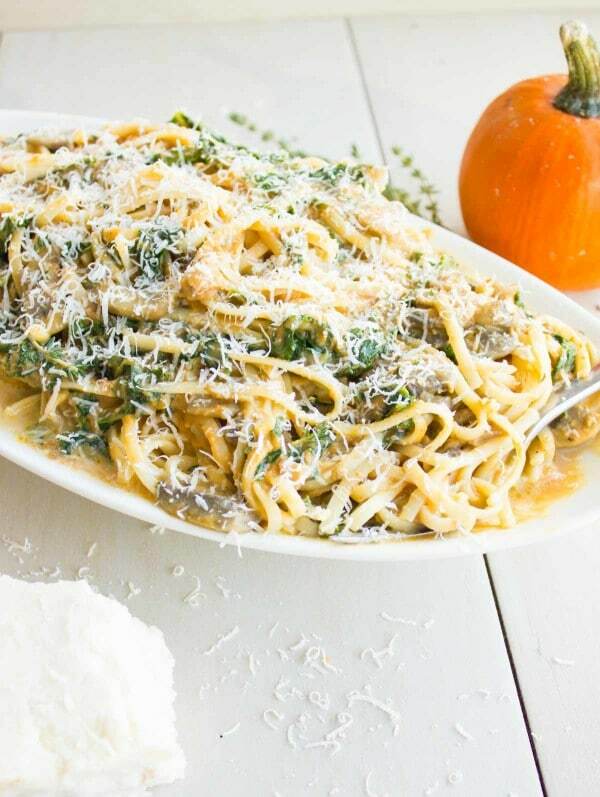 This kale mushroom pumpkin Alfredo pasta recipe is an easy fall-inspired pasta dish you can make in under 20 mins! Sautéed kale and mushrooms drenched in a smooth creamy pumpkin Alfredo sauce—spiked up with a little bit of garlic, and sweetened with pumpkin and a pinch of allspice, then finished off with fresh thyme and Parmesan. Start by cooking your pasta according to the box directions. Once the pasta is done, drain and reserve about ½ cup of pasta water on the side to thin out the sauce to your desired consistency. Preheat a cast iron or a non-stick skillet over medium heat and add the butter. Add the mushroom, kale and garlic when the butter melts and season with a pinch of salt. Sauté the mixture for 2 minutes until the veggies soften up a little. At that point add in the cream, pasta water and pumpkin puree and lower the heat to medium-low. Season the cream mixture with salt and pepper and fresh thyme. Simmer the sauce for about 2 mins and then toss the pasta into the creamy sauce. Start thinning out the sauce with some of the reserved pasta water to the thickness you like. Add the parmesan cheese and give the pasta a final toss and serve. The proportions of pasta water and cream are very personal. Optimal Alfredo sauce will consume the 1 cup of cream and 1/2 cup of pasta water. Light Alfredo Sauce can use as little as 2 Tablespoons of cream with 1 cup of pasta water.